The Dave Clark Five’s 1964 number one hit Glad All Over plays the teams out at Selhurst Park but it was the Burnley team and fans who were glad all over when Bobby Madley’s final whistle signalled a 2-0 win, and our first away win of the season. As the players came over to the fans at the end, the atmosphere was electric in the Arthur Wait Stand. There was huge relief at finally getting that win on the road but, more so, a very strong belief that no matter what happens now we can surely be preparing for Premier League football again next season. With a 1-0 lead for 78 minutes of the game, the second from Andre Gray on 85 minutes was a real tension easer as clocks were being checked numerous times a minute, but there can be no denying that we were fully deserving of the points after an outstanding team performance where all thirteen players on view showed terrific form and gave us everything. The 5:30 p.m. kick off at least ensured a sensible departure time and, given the fiasco last time, I’d vowed never to go to Selhurst Park by road again. Our choice was to park at Stanmore and then get the underground into Victoria and the over ground to Selhurst. It worked a treat, taking us past two football grounds, one where we won’t play a league game next season, namely Barnet, and another, Wembley, where I’m expecting to watch us play Spurs. That meant no traffic and parking problems in the vicinity of the ground but having got there I found my ticket wasn’t going to let me in. After some kerfuffle involving numerous stewards, they allowed me access and I was ready to take my standing position for the game. Playing in the yellow kit previously used at West Ham when the same referee Bobby Madley’s poor decision cost us the game, we’d made four changes to the team beaten by Manchester United. The injured Ben Mee was replaced by James Tarkowski; it was the first time Ben had failed to start a league game for us since December 2014. One other change was needed with Ashley Westwood coming in for the suspended Joey Barton. The other two changes were a surprise to most I would think with Scott Arfield preferred to Robbie Brady and Gray, probably our best player in the previous game, sitting it out with Sam Vokes recalled to partner Ashley Barnes up front. Once the eagle had done its bit, followed by the Dave Clark Five, the choreographed Selhurst Park atmosphere got underway with its drums and flags as Palace made a very good start, winning four corners in the first three minutes or so. It looked a frightening start for us but thankfully the corners came to nothing, other than one routine save from Tom Heaton and no sooner had we ended that early onslaught than we’d taken the lead through Barnes. It was Barnes who started and ended the move. He received criticism last week for his performance against Manchester United but was in superb form this time. He nicked the ball from a Palace defender and played it to Vokes. He found Westwood who got the ball out to Stephen Ward on the left hand side. Barnes got in front of the defender and onto the low cross, turning it in through Wayne Hennessey’s legs with his second touch. It was just what we needed, the third time we’d gone 1-0 up away from home this season and on all three occasions the goal has come from Barnes. This time we weren’t about to let it go although we had a scare a few minutes later when Wilfried Zaha went clear. Up went the flag for offside; down went Zaha in a challenge with Tom Heaton. The flag shouldn’t have gone up; it did, we got away with it and at least it gave Sam Allardyce something to whinge about at the end. We were, undoubtedly, the better side in the first half. Barnes had the ball in the net again only for it to be ruled out for handball after what seemed an age, Vokes headed a Matt Lowton cross over and then brought a terrific save out of Hennessey from another header, this time from a Ward cross. Just as we were heading for half time with that 1-0 lead we suffered a blow. Ward had been doubtful ahead of the game but went down for a second time in a matter of minutes. He’d been outstanding in the first half but there was no chance of playing on this time and in stoppage time he was replaced by Jon Flanagan who hasn’t featured in the league since he deputised for the suspended Lowton on Boxing Day and not at all since the Lincoln game. There were long spells in the second half when we clearly had some defending to do. Heaton made a couple of saves, one of them an outstanding tip over to deny Damien Delaney. They also had, what they thought were strong appeals for a penalty when Zaha went down under a challenge from Flanagan who had an excellent second half. Had it been given it would have been really soft, let’s face it, even Alan Shearer said it wasn’t a penalty. It did seem as though they might find a way through, but we were so well organised, we had our framework in place, we defended so very well, there were very few chances for the home side. In fact the best two probably came our way when first Vokes and then Barnes got clear. With just over ten minutes remaining, Dyche brought on the player who might exploit that better. On came Gray for Barnes who rightly received a superb ovation from the travelling Clarets. If the pressure wasn’t mounting on the pitch, it was in my head. The minutes ticked by and then Palace tried to play the ball forward but it got no further than George Boyd who played a superb left footed through ball for Gray. He moved forward and finished with a shot that was so close to Hennessey but one he could do nothing about. The away fans just simply erupted as the players celebrated right in front. Surely, with only five minutes left, plus a bit of stoppage time, we would do it. Time never passes quickly enough when you want it to but we got through those five minutes and the four added on by Madley with no serious worries and the celebrations at the final whistle were wild. We had finally done it. We had finally won an away game, our first since the last game of last season almost a year ago. I’m not quite sure how we haven’t and there have been games when I think we’ve been very unfortunate. No one could deny us this one though. Gary Lineker even told Match of the Day viewers that it was our first top flight win in London since 1975. He was right of course, it was at QPR on 11th January 1975 when a Ray Hankin goal gave us a 1-0 win. The whole team performance was outstanding and it almost seems wrong to single out individuals. Both Michael Keane, on his 100th league appearance for Burnley, and Barnes were up there as man of the match candidates for me but I’ll add two others whose performances were exceptional, even more so given how little football they’ve played recently. Westwood was one. He stepped into Joey’s boots as if he’s always worn them. Joey; his name was chanted on 19 minutes and he himself celebrated the win with a tweet at the final whistle. Westwood was brilliant but what about James Tarkowski on what was his first ever start in the Premier League? It was an awesome performance from him and he even took time out to head away a cigarette lighter. On a serious note, I hope Crystal Palace don’t get into trouble for that. They can’t seriously be held responsible if some clown decides to start throwing a lighter onto the pitch. That’s 39 points, far more than I thought would be needed. We mathematically can’t finish in the bottom two now and, after today’s results, Swansea would need to win all three of their remaining games to put us under pressure. If they achieved that, against all the odds, we would only need a couple of points. We can’t say we are there yet, but I can see the finishing line. The fat lady might not be singing yet but she has gargled and is on her way to the stage. All we had left was the long journey home. It was a damn good journey home though. It always is after win, even more so after such a long time and it being such an important three points. For years I never thought we’d ever play in the Premier League and now we are on the brink of staying in it and what an achievement that is. we should all be feeling glad all over. Crystal Palace: Wayne Hennessey, Joel Ward, Martin Kelly, Damien Delaney, Patrick van Aanholt, Luka Milivojevic, Wilfried Zaha, James McArthur (Fraizer Campbell 71), Jason Puncheon, Andros Townsend, Christian Benteke (Loic Remy 71). 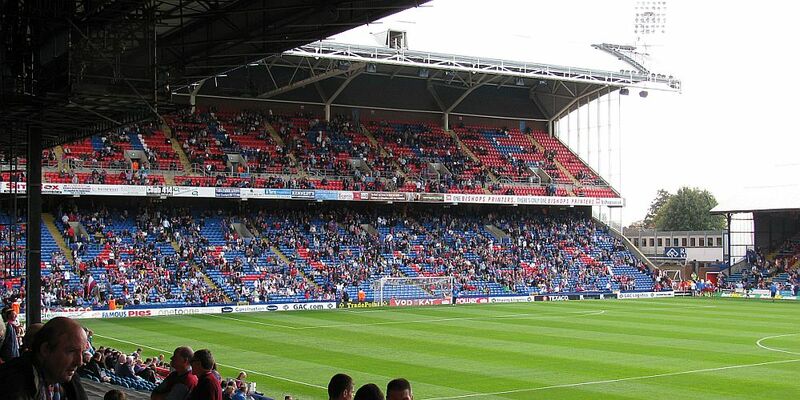 Subs not used: Julian Speroni, Mathieu Flamini, Jeffrey Schlupp, Chung-yong Lee, Bakary Sako. Yellow Cards: Christian Benteke, Wilfried Zaha. Burnley: Tom Heaton, Matt Lowton, Michael Keane, James Tarkowski, Stephen Ward (Jon Flanagan 45+1), George Boyd, Jeff Hendrick, Ashley Westwood, Scott Arfield, Sam Vokes, Ashley Barnes (Andre Gray 79). Subs not used: Nick Pope, Kevin Long, Steven Defour, Johann Berg Gudmundsson, Robbie Brady.